It is an honor to be given the privilegde to invite you to the (ASEAN's Leading International Trade Show for Power Generation, Solar Energy, Smart Home, Lighting Cable, Electronics & Component). 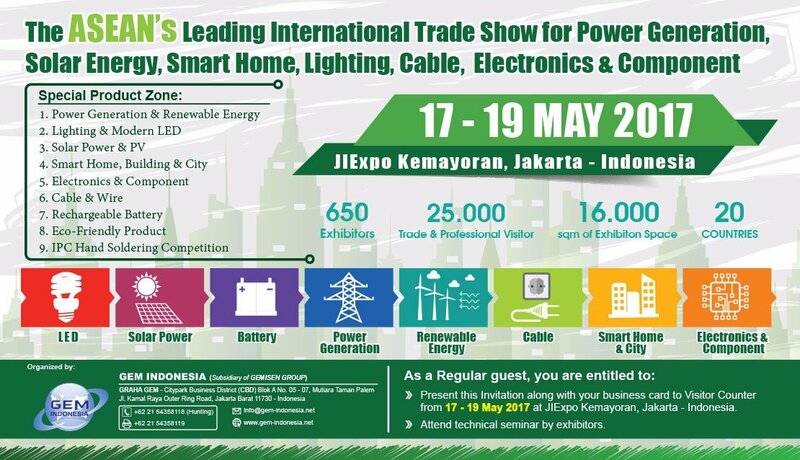 The trade show will be held at the (JIExpo Kemayoran, Jakarta-Indonesia) on 17-19 May 2017. The trade show will start at 10.00 am till 6.00 pm. We will focus on our standard products such as Automated Optical Inspection System, Robot Soldering & Robot Screwing System and many more.That is why we would like to invite you to come over to have a look at our Great Booth D1E2-12. You can join us there for a drink and a friendly chat with our 'EVO Technical Crews'. It is the perfect opportunity to get to know each other better and learn more about what we have to offer you.